MOSCOW, Idaho — Sept. 24, 2018 — Data from the international Cassini spacecraft, which explored Saturn and its moons between 2004 and 2017, has revealed what appear to be giant dust storms in the equatorial regions of Titan, Saturn’s largest moon. A team of scientists, including University of Idaho astrophysicist Jason Barnes, published their findings today in the journal Nature Geoscience. Titan is the only moon in our solar system with a substantial atmosphere and the only celestial body other than Earth known to have stable bodies of surface liquid. Titan’s rivers, lakes and seas are filled primarily with methane instead of water, however. Around the equinox — when the sun crosses Titan’s equator — massive clouds can form in tropical regions and cause powerful methane storms. Graham Vixie, who was working on his doctorate under Barnes, and Jacob Bow, a U of I undergraduate at the time, originally noticed short-lived bright spots around Titan’s northern equinox while studying infrared images taken by Cassini in 2009. Modelling by the research team suggested the bright features were a thin layer of tiny, solid, organic particles in the atmosphere. The analyses indicated the bright spots were most likely clouds of dust raised from dune fields around Titan’s equator. “For the moment, the only satisfactory explanation for these strong surface winds is that they might be related to the powerful gusts that may arise in front of the huge methane storms we observe in that area and season,” said Sebastien Rodriguez, lead scientist on the study and an astronomer at the University Paris Diderot, France. The existence of such strong winds and the generation of massive dust storms implies the underlying sand can be set in motion and the giant dunes covering Titan’s equatorial regions are still active and continually changing, according to researchers. The winds could be transporting the dust raised from the dunes across large distances, contributing to a global cycle of organic dust on Titan similar to cycles observed on Earth and Mars. Barnes is a member of a research team that hopes to send a drone-like rotocraft to Titan. The team is one of two finalists for funding from NASA’s New Frontiers Program. This project was funded under the National Aeronautics and Space Administration grant No. NNX09AP34G. The total amount of federal funds received by the University of Idaho is $174,144, which amounts to 100 percent of the total cost of the project. 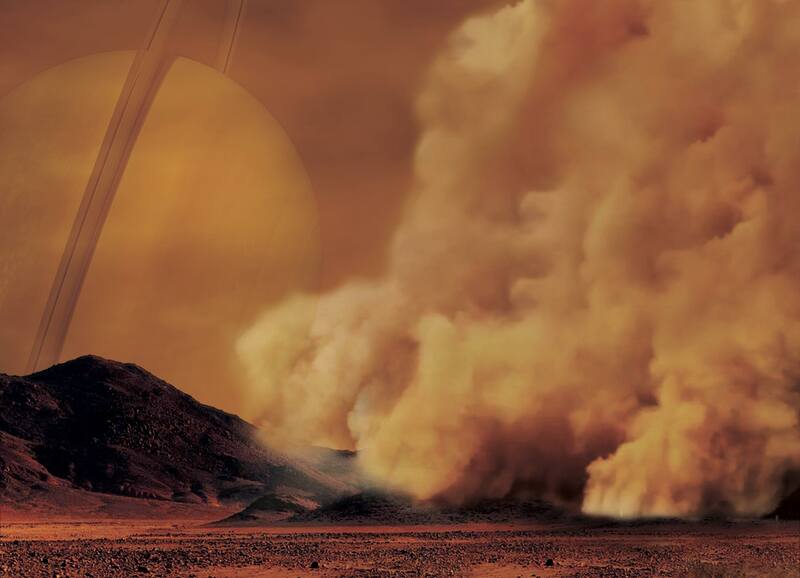 An artistic impression of a dust storm on Titan is attached to this news release. The image can be reprinted with credit to IPGP/Labex UnivEarthS/University Paris Diderot – C. Epitalon and S. Rodriguez.